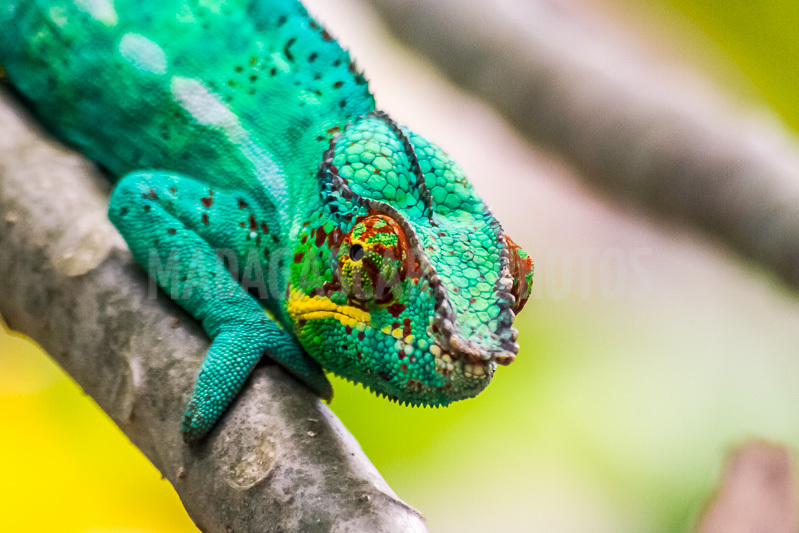 The Panther Chameleon (Furcifer pardalis) is a species of chameleon of rather large size originally endemic of Madagascar, but introduced to Reunion island for several years. It is one of the largest existing chameleons, its size can reach 1,80 ft tail included for the male and 1,15 ft for the female. The female lives about 3 years, the male can reach 5 years. The species has various colorations (called "phases") characteristic of the different Madagascan regions from which it may originate. The females have rather dull hues, whereas the males have very spectacular colors: Nosy Be island: green and turquoise blue ; Tamatave (East of Madagascar) : white and red ; Diego Suarez (northeast of Madagascar): Bright green with dark red vertical stripes and a thick white horizontal line on each side ; Maroantsetra : green background khaki and dark red ; Ankaramy (south of Madagascar) : hot pink. This camelon feeds on various insects that come within range. Its manners are diurnal and exclusively arboreal. It is an oviparous animal, which deposits between 15 and 50 eggs by spawn. Its lifespan is 4 years maximum.